What beat frequencies will be present: (a) If the musical notes A and C are played together (frequencies of 220 and 264 Hz)? (b) If D and F are played together (frequencies of 297 and 352 Hz)? (c) If all four are played together? This is College Physics Answers with Shaun Dychko. The beat frequency, which is the frequency with which the amplitude is oscillating is going to be the absolute difference between the two frequencies. So, for part A, the beat frequency will be the absolute difference between the frequency of the note A and the note C. So, that's the difference between 264 hertz minus 220 hertz, which is a beat frequency of 44 hertz. 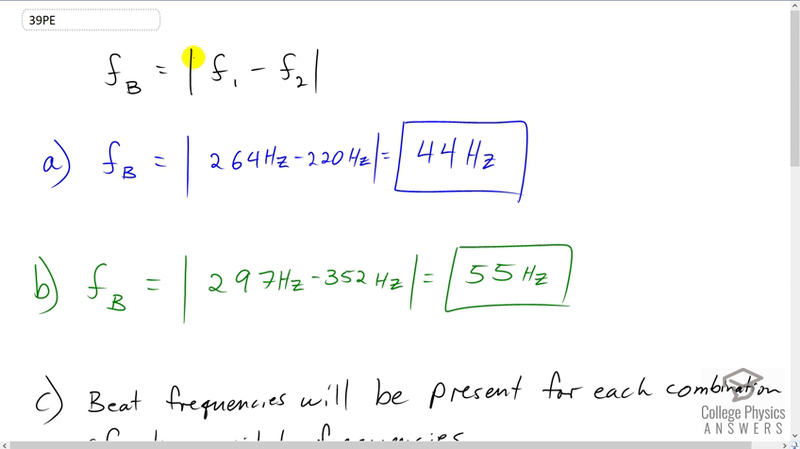 And for part B, we're finding the difference in frequencies in D and F, which are 297 and 352, and this works out to 55 hertz. And notice this would be negative, but the absolute value bar just means we take the positive. And then, if both frequencies or beat frequencies will be present for all four... If all four of these frequencies are played together, there's going to be a beat frequency for every pair of possible frequencies. So we have note A, C, D, and F all being played at the same time. And, that's going to result in six different possible pairs, each of which will produce a beat frequency. So, when A is paired with C, that makes a difference of 44 hertz. A and D has a difference of 77 hertz. Note A and note F is 220 minus 352, absolute value of which is 132 hertz. And then, C D makes 33 hertz, and note C and F, the difference is 88 hertz. And, for D and F, the difference is 55 hertz.